Azure IoT Hub には、デバイスやバックエンドの開発者が堅牢なデバイス管理ソリューションを構築するために使用できる機能や拡張モデルが用意されています。Azure IoT Hub provides the features and an extensibility model that enable device and back-end developers to build robust device management solutions. デバイスは、リソースの制約の大きいセンサーをはじめ、専用マイクロコントローラー、デバイス グループの通信をルーティングする強力なゲートウェイなど、多岐にわたります。Devices range from constrained sensors and single purpose microcontrollers, to powerful gateways that route communications for groups of devices. また、用途や IoT オペレーターの要件は業界によってかなり異なります。In addition, the use cases and requirements for IoT operators vary significantly across industries. このような違いがありながら、IoT Hub によるデバイス管理で提供される機能、パターン、およびコード ライブラリは、多様なデバイスとエンド ユーザーに対応することができます。Despite this variation, device management with IoT Hub provides the capabilities, patterns, and code libraries to cater to a diverse set of devices and end users. 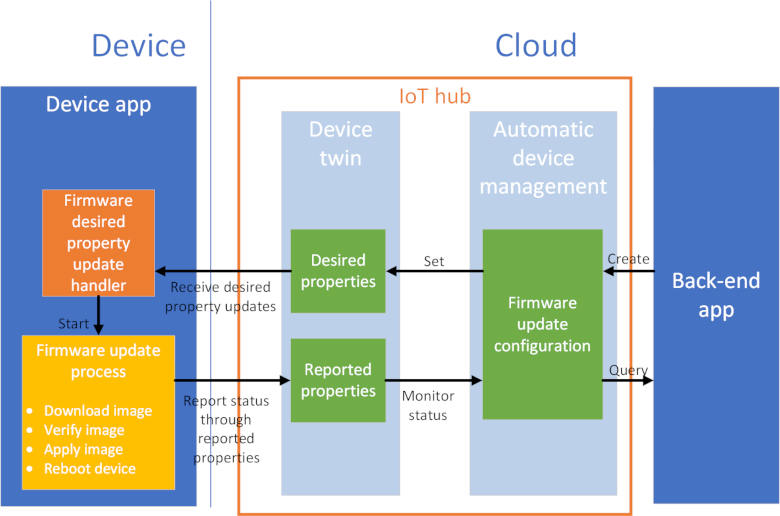 デバイス管理に対する Azure IoT Hub のアプローチの概要。A brief overview of Azure IoT Hub approach to device management. 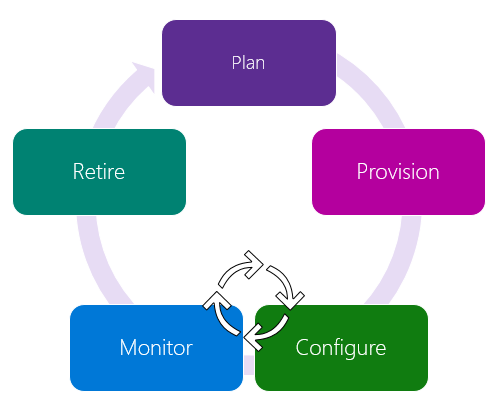 一般的なデバイス管理の原則の説明。A description of common device management principles. デバイスのライフサイクルの説明。A description of the device lifecycle. 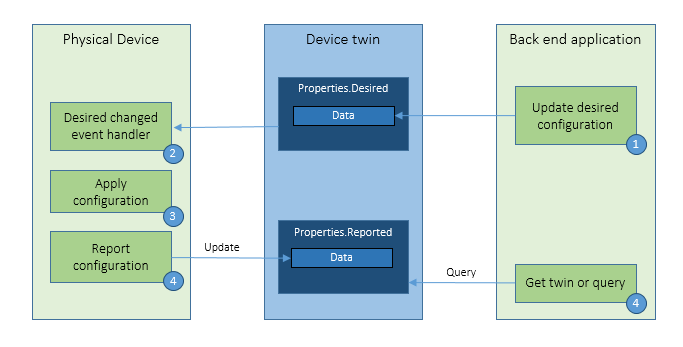 一般的なデバイス管理パターンの概要。An overview of common device management patterns. スケールとオートメーション: IoT ソリューションには、日々の作業を自動化して比較的少人数の運用スタッフで何百万台というデバイスを管理できるシンプルなツールが必要です。Scale and automation: IoT solutions require simple tools that can automate routine tasks and enable a relatively small operations staff to manage millions of devices. 日常的な業務としてオペレーターは、多数のデバイスを遠隔から一括で操作し、直接の対応が必要な問題が発生した場合にだけ通知を受け取りたいと考えます。Day-to-day, operators expect to handle device operations remotely, in bulk, and to only be alerted when issues arise that require their direct attention. 開放性と互換性: デバイスのエコシステムはきわめて多様です。Openness and compatibility: The device ecosystem is extraordinarily diverse. 数多くのデバイス クラス、プラットフォーム、プロトコルに管理ツールを適合させる必要があります。Management tools must be tailored to accommodate a multitude of device classes, platforms, and protocols. オペレーターは、制約が最も厳しいシングル プロセスの組み込みチップから、フル機能の高性能コンピューターまで、さまざまな種類のデバイスをサポートできなければなりません。Operators must be able to support many types of devices, from the most constrained embedded single-process chips, to powerful and fully functional computers. さまざまなスタッフへの情報提供: IoT 運用スタッフがそれぞれに抱えるワークフローやプロセスに対応することが不可欠となります。Service many roles: Support for the unique workflows and processes of IoT operations roles is crucial. 運用スタッフは、社内 IT 部門に課せられた制約に適合しながら、The operations staff must work harmoniously with the given constraints of internal IT departments. デバイス運用情報を、監督者やその他の管理職に継続的かつリアルタイムに伝える必要があります。They must also find sustainable ways to surface realtime device operations information to supervisors and other business managerial roles. 計画: オペレーターは、デバイスのメタデータ体系を作成できます。これらのプロパティを使用することで、簡単かつ正確に一連のデバイスを照会して一括管理操作の対象にすることができます。Plan: Enable operators to create a device metadata scheme that enables them to easily and accurately query for, and target a group of devices for bulk management operations. デバイス ツインを使用すると、このデバイスのメタデータをタグやプロパティの形式で保存できます。You can use the device twin to store this device metadata in the form of tags and properties. プロビジョニング: IoT Hub に対して新しいデバイスを安全にプロビジョニングし、デバイスの機能をオペレーターがすぐに検出できるようにします。Provision: Securely provision new devices to IoT Hub and enable operators to immediately discover device capabilities. IoT Hub ID レジストリを使用して、柔軟性に優れたデバイス ID と資格情報を作成し、ジョブを使用してこの操作を一括で実行します。Use the IoT Hub identity registry to create flexible device identities and credentials, and perform this operation in bulk by using a job. デバイス ツインのデバイス プロパティを使ってその機能や状態を報告できるように、デバイスを構築します。Build devices to report their capabilities and conditions through device properties in the device twin. 構成: 正常性とセキュリティを維持すると共に、デバイスに対する一括構成変更とファームウェア更新を効率化します。Configure: Facilitate bulk configuration changes and firmware updates to devices while maintaining both health and security. こうしたデバイス管理操作は、Desired プロパティ、またはダイレクト メソッドとブロードキャスト ジョブを使用して一括で実行します。Perform these device management operations in bulk by using desired properties or with direct methods and broadcast jobs. 監視: デバイス コレクション全体の正常性や、進行中の操作の状態を監視して、対処が必要な問題があればオペレーターに通知します。Monitor: Monitor overall device collection health, the status of ongoing operations, and alert operators to issues that might require their attention. デバイス ツインを適用して、デバイスが稼働状況と更新操作の状態をリアルタイムで報告できるようにします。Apply the device twin to allow devices to report realtime operating conditions and status of update operations. デバイス ツインのクエリを使用して緊急を要する問題を報告するための強力なダッシュボード レポートを作成します。Build powerful dashboard reports that surface the most immediate issues by using device twin queries. 使用中止: 故障後やアップグレード サイクルの終了後、またはサービス有効期間の経過後に、デバイスを交換またはデバイスの使用を停止します。Retire: Replace or decommission devices after a failure, upgrade cycle, or at the end of the service lifetime. デバイス ツインを使用して、物理デバイスが交換されている場合は、デバイス情報を保持します。使用中止になっている場合はアーカイブされます。Use the device twin to maintain device info if the physical device is being replaced, or archived if being retired. IoT Hub ID レジストリを使用して、デバイス ID と資格情報を安全に失効します。Use the IoT Hub identity registry for securely revoking device identities and credentials. 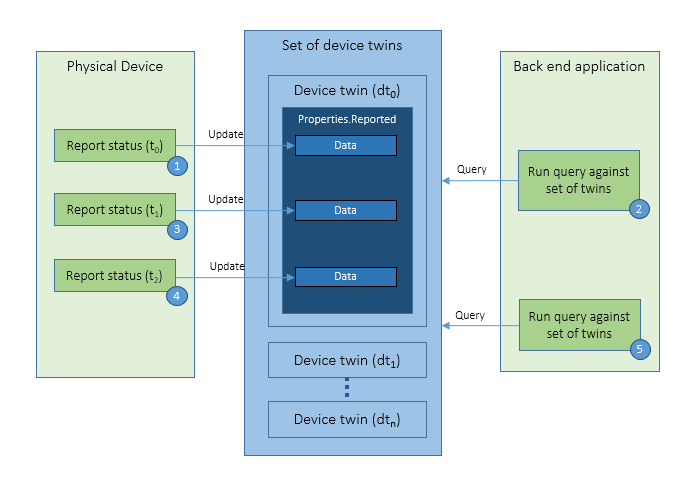 以下に示したのは、IoT Hub によって実現される一連のデバイス管理パターンです。IoT Hub enables the following set of device management patterns. デバイス管理のチュートリアルでは、このパターンを実際のシナリオに合わせて拡張する方法と、こうしたコア テンプレートに基づいて新しいパターンをデザインする方法について詳しく説明しています。The device management tutorials show you in more detail how to extend these patterns to fit your exact scenario and how to design new patterns based on these core templates. 再起動: バックエンド アプリが、再起動を開始したことを、ダイレクト メソッドを通じてデバイスに伝えます。Reboot: The back-end app informs the device through a direct method that it has initiated a reboot. デバイスは、報告されるプロパティを使用して、その再起動状態を更新します。The device uses the reported properties to update the reboot status of the device. 出荷時の設定にリセット: バックエンド アプリが、出荷時の設定へのリセットを開始したことを、ダイレクト メソッドを通じてデバイスに伝えます。Factory Reset: The back-end app informs the device through a direct method that it has initiated a factory reset. デバイスは、報告されるプロパティを使用して、そのデバイスの出荷時の設定へのリセット状態を更新します。The device uses the reported properties to update the factory reset status of the device. 構成 - バックエンド アプリでは、必要なプロパティを使用して、デバイス上で実行されているソフトウェアが構成されます。Configuration: The back-end app uses the desired properties to configure software running on the device. デバイスは、報告されるプロパティを使用して、その構成状態を更新します。The device uses the reported properties to update configuration status of the device. ファームウェアの更新プログラム: バックエンド アプリケーションでは、自動デバイス管理構成を使用して更新プログラムを受け取るデバイスが選択され、更新プログラムを受け取る場所がデバイスに通知され、更新プロセスが監視されます。Firmware Update: The back-end app uses an automatic device management configuration to select the devices to receive the update, to tell the devices where to find the update, and to monitor the update process. デバイスは、複数のステップから成るプロセスを開始してファームウェア イメージをダウンロード、検証し、それを適用して、デバイスを再起動して IoT Hub サービスに再接続します。The device initiates a multistep process to download, verify, and apply the firmware image, and then reboot the device before reconnecting to the IoT Hub service. この複数のステップから成るプロセスの間、デバイスは、報告されるプロパティを使用して、デバイスの進行状況と状態を更新します。Throughout the multistep process, the device uses the reported properties to update the progress and status of the device. 進行状況とステータスの報告: ソリューション バックエンドによって、一連のデバイス対してデバイス ツイン クエリが実行され、デバイス上で実行されている操作のステータスと進行状況が報告されます。Reporting progress and status: The solution back end runs device twin queries, across a set of devices, to report on the status and progress of actions running on the devices. IoT Hub でデバイス管理用に提供される機能、パターン、コード ライブラリを使用することで、デバイスのライフサイクル ステージごとのエンタープライズ IoT オペレーター要件を満たす IoT アプリケーションを作成できます。The capabilities, patterns, and code libraries that IoT Hub provides for device management, enable you to create IoT applications that fulfill enterprise IoT operator requirements within each device lifecycle stage. IoT Hub のデバイス管理機能についての学習を続けるには、デバイス管理の概要に関するチュートリアルをご覧ください。To continue learning about the device management features in IoT Hub, see the Get started with device management tutorial.